This article is an extension of Calculate MACD in Excel and technical indicators covered in an earlier post. The same trend indicators have been applied towards Commodities and Precious Metals here. The idea behind investing in precious metals is that it protects your portfolio against high inflation. Historically, people look to commodities like gold and silver during turbulent economic times. 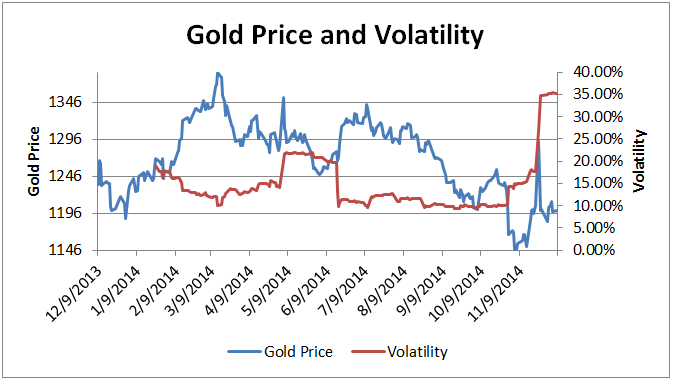 In the past decade, gold and silver have gained popularity and remained a significant part of many portfolios. Finance experts have weighed in heavily about this topic, and it has been kind of controversial. The argument for Precious Metals is that they are tangible and retain their intrinsic value. Investing in gold and silver keeps your portfolio balanced. So when the value of the dollar drops due to high inflation, at least part of your portfolio will keep its value. Critics point out that a complete economic collapse is unlikely. The argument against Precious Metals is that, historically, collapsed economies revert to bartering and not Commodities. Let us dive into building a model in Excel which covers several technical trading indicators for Commodity and Precious Metals. When trading commodities, a trader will very likely use the same indicators on a chart to predict the future as with other asset class and instruments such as equities. On a broader view, charts that reflect long periods such as monthly, should be used to assess primary trends. Shorter periods (daily) are used to gauge the entry and exit point of a trade. For analyzing Technical Indicators on commodity markets, the first requirement is to identify the trend. Once the trend has been identified, an analyst can apply some of the commonly used indicators – Moving Averages, MACD, Relative Strength Index (RSI) and Bollinger Bands. The spreadsheet is very easy to use. The Web Service enabled spreadsheet downloads historic prices of the commodity of your choice based on the date ranges. But there’s more to it. The spreadsheet plots technical charts, fills in the raw and computed data for technical indicators such as 12 and 26 day EMA, Volatility, and MACD. All the magic happens in the background. Both the historical prices and computed columns can be found in the “Data” sheet. Signal Line crossover, a commonly used MACD signal is a 9-day estimated moving average of the MACD line. The signal line trails the MACD line and helps spot MACD turns. A bullish crossover happens when the MACD line goes up and stays above the signal line. A bearish crossover occurs when the MACD turns down and crosses below the signal line. In the chart below, a sharp and a prolonged upturn is represented with a green arrow. A sharp and a prolonged downturn is shown with a red arrow. For brief period of slight up and down crossovers, grey arrows have been used for depiction. Signal line crossovers both at positive and negative extremities should be approached with caution. It takes a strong move in the commodity to push momentum to an extreme. Few examples of strong moves that come to mind are – rampant inflation, geo-political issues, major wars, extreme bullish or bearish equity markets etc. 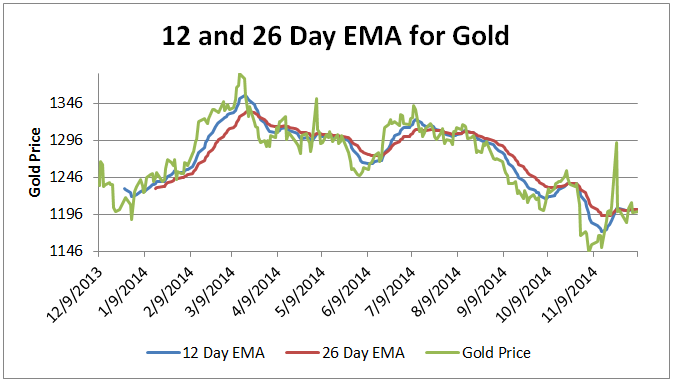 The above two charts shows Gold spot prices with its 12-day EMA in blue, 26-day EMA in red, and MACD line in blue. There were 16 signal line crossovers in last one year; 8 ups and 8 downs. The Gold had a continuing declining trend from June-2014 till beginning of Dec-2014; indicating a prolonged bearish trend. The MACD indicator is important because it brings momentum and trend in one indicator. The unique combination of trend and momentum can be applied to weekly, monthly or yearly charts. See for yourself by downloading this free spreadsheet. Does MACD come with built in risk controls and profit targets? 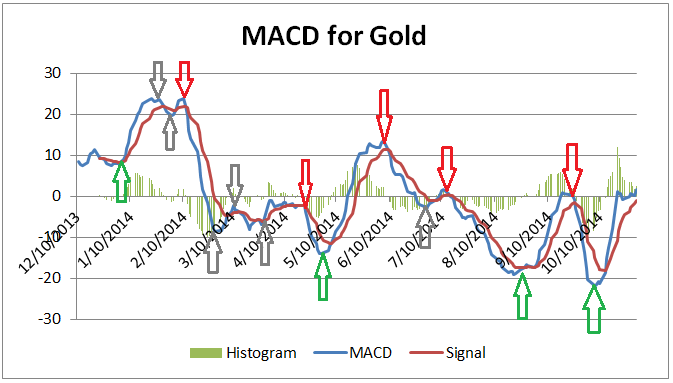 MACD is an indicator, not a strategic tool. Is this a Quandl based commodity web service? Do you have a REST JSON based implementation of this program? Need the Quandl API key for Gold Prices.